Hard to figure - was the market up/down/sideways last week. The SPX500 was up about 1%, the Dow just over 1/2% up and R2k was down. As you probably know if you have followed my blog for a while I trade RWM (inverse R2K, R2K down then RWM up). I guess I can claim to be right by picking one Index, but I generally chart SPX so we were sideways almost (right on no big move) and was looking good mid week, but not so good by week end. Not exactly as I called it, but close. 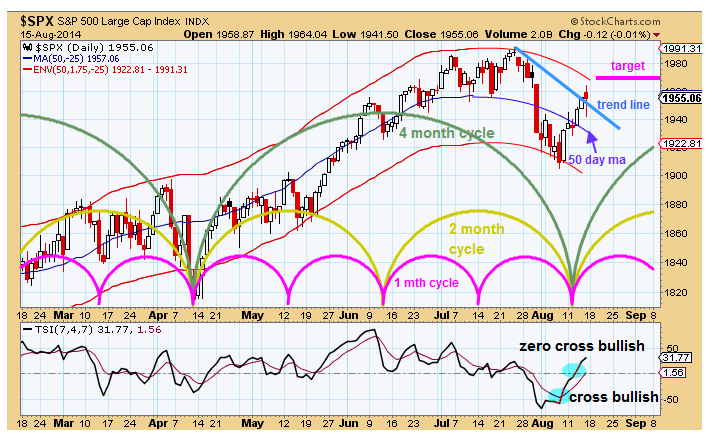 This next week we have 3 shorter cycles (1 month, 2 month, 4 month) up with some longer cycles down. So moving up will encounter some headwinds (longer cycles down and who knows about Ukraine, Iraq, Syria, Hamas, etc.). From a cycle perspective it looks like mixed during the week as the Market struggles upwards (my guess would be around +20 pts. on SPX500). If we test/exceed old highs might want to trade some RWM? took just 2 days to exceed weekly target. Looks like we could break old highs on SPX this week. Market exceeded my expectations. Had a "gut" feeling this might happen. Still waiting on ^rut (R2k) to go a bit higher tow buy RWM (lower price). Sometimes you need to listen to your "gut"